Disclaimer: I read a review copy of this book, sent to me for free by the publishers. Amreekan Desi: Masters of America (AD: MoA) has worthy predecessors such as Anurag Mathur's Inscrutable Americans. 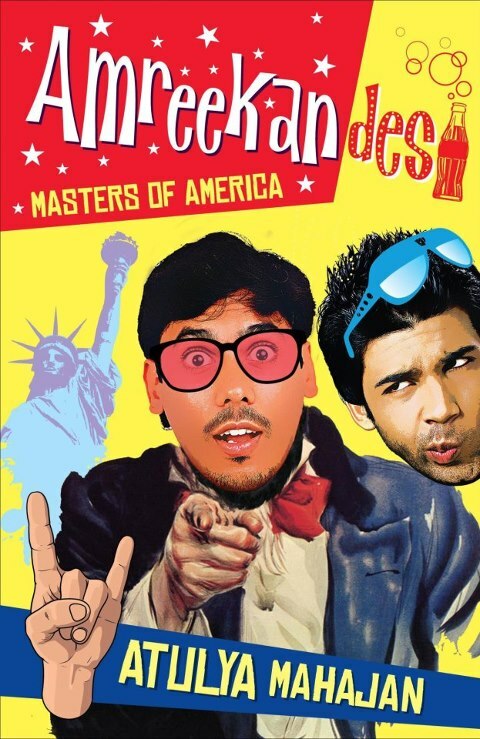 AD: MoA is also an FOB book - it's about a couple of clueless Indian students who land up in Amreeka to do a Masters in Sciences degree, and who (of course) end up mastering a whole lot of other things as well. Our two students are Akhil Arora from Delhi, and Jaspreet Singh (Jassi) from Punjab. Akhil Arora is the nerd who wants to study hard and get a job, and Jassi is the dude who wants to date women and get laid. This sets up the story nicely, "Here's the good boy, and here's the bad boy - now let's see if they achieve their dreams." It's pretty evident that the story is based on the author's own experiences as an FOB Indian in America. He seems to identify with Akhil Arora - Akhil does all the good-boy stuff - he studies, he gets a job, he learns cooking, he falls in love. He even goes back disgusted from a wet t-shirt contest! Jassi, on the other hand, is the one who is meant to get into all the bad situations. I won't give the plot away, but Jassi provides the foil to Akhil's seriousness, and injects some much-needed humour into the book. If you're into commercial literature in general, you'll like this book. It's a quick read - it'll help kill a few hours on a flight, but don't expect it to last an entire train journey! It'll give you a few laughs and make you smile at the naivety of the two boys. I wish the characters had been better drawn, though. Some are so cardboard cutout-ish that the author himself seems to get confused sometimes - a character named Aparna is referred to as Devika for a whole scene! Which leads me to my other grouse - how bad the editing is. There are typos galore, basic errors such as the one I mentioned above, and sentences that I wanted to scratch out and reconstruct immediately. What kind of a self-respecting editor lets a book out of the stable in this state? But I know I'm not the target audience for this book. It's aimed at young geeks like Akhil Arora - who aspire to travel aboard, who want to get a girl of their own, who aim to get an awesome job in an Amreekan company. For such people, the book will be a gift from heaven. It tells them what to expect in simple language, as part of a larger story. They can even add to the handful of 'fiction books' they've read! Why is it, I wonder, that the funny bloggers don't always churn out the best fiction? I used to love Sidin Vadukut's blog in its heyday, but I didn't like the first Dork too much (I didn't bother reading the rest). The problem with both Dork and Amreekan Desi are pretty much the same - the quality of writing, the depth of the characters, the stop-and-start narrative.